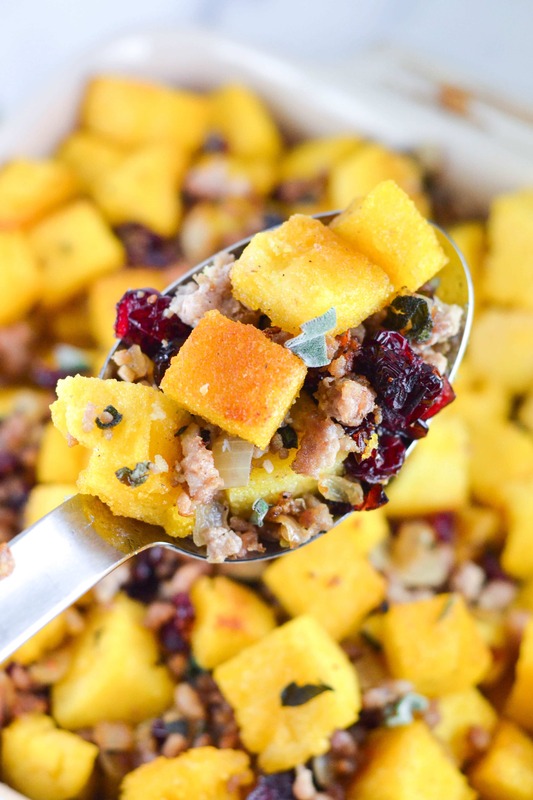 This cranberry pork polenta stuffing is the perfect gluten-free and dairy-free stuffing for your Thanksgiving meal! You’ll love the flavor the crispy polenta adds to the stuffing! As soon as Halloween is over, I’m ALLLLL about Thanksgiving! Thanksgiving has always been one of my favorite holidays, even after my celiac disease diagnosis. My family has been super great about making recipes that are gluten-free, dairy-free and egg-free that I can eat. Gluten-free turkey gravy, sweet potato casserole without the butter, even vegan apple pie! It’s pretty much a Megan friendly Thanksgiving haven – REALLY! On years that I don’t eat at my parents house, I make my own Thanksgiving dinner and bring a plate with me wherever I go. It sounds somewhat depressing, I know – but you know what – I get to eat all of my favorite things and don’t even have to share! If you ask me, Thanksgiving dinner is never complete without a stuffing. Now obviously stuffing is traditionally made with bread or bread crumbs so obviously a gluten-free no no. I know there are gluten-free breads on the market… but when you’re gluten-free, dairy-free, egg-free AND yeast-free (UGH on this one!) then you have to get a little creative. 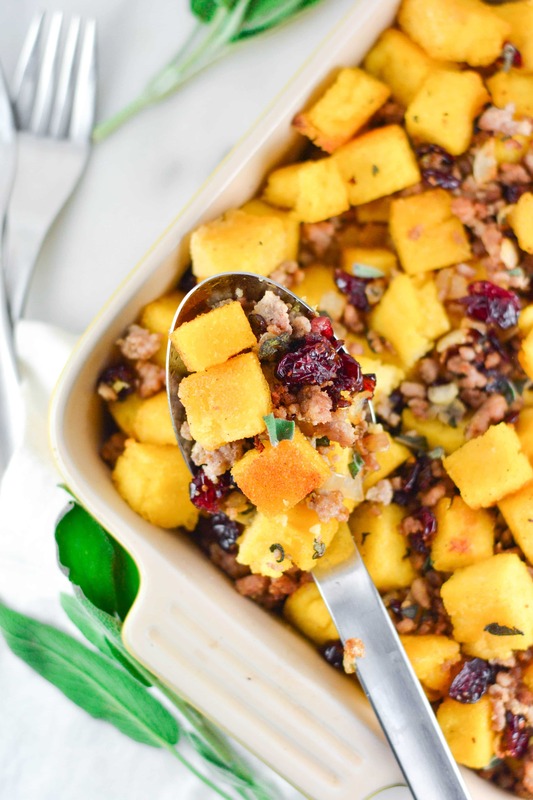 I typically go with a gluten-free cornbread stuffing which is absolutely amazing! But this year, I decided to try out using polenta in my gluten-free stuffing. And let me tell you… OH MY GOODNESS is it good! Polenta is kind of amazing if you ask me. After cooking on the stove top, it firms up so easily and can be baked until crispy to resemble something “close” to stale bread used in stuffing – only way more flavorful and delicious in my opinion. Tell me in the comments, what’s your favorite Thanksgiving memory or favorite Thanksgiving food? 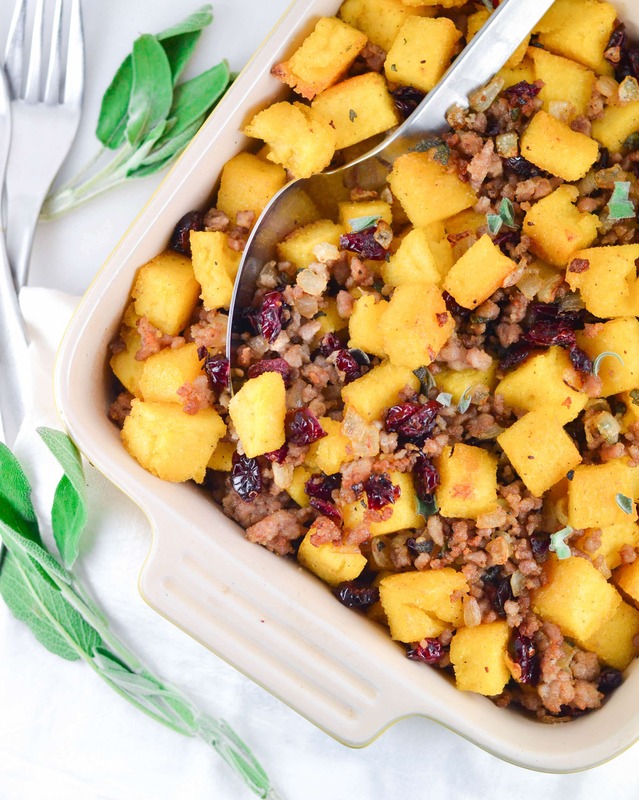 Polenta makes a great gluten-free substitute in a traditional stuffing in this cranberry pork polenta stuffing recipe. 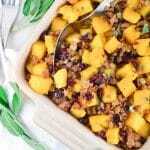 Sage and dried cranberries are added to the mix for a flavorful side dish! Bring water to boil in a large pot. Slowly add polenta to the pot and stir constantly until the polenta and water are mixed. Lower the heat to medium-low. Add 2 teaspoons of the salt and the ground black pepper to the pot. Stir frequently for 10-15 minutes, or until polenta starts pulling away from the pot. Pour into a 9x13 baking dish (sprayed with cooking spray), spread with a wet or oil covered spatula, and refrigerate for 30-45 minutes. Once the polenta has cooled and set, cut into 1/2 inch cubes. Preheat the oven to broil. 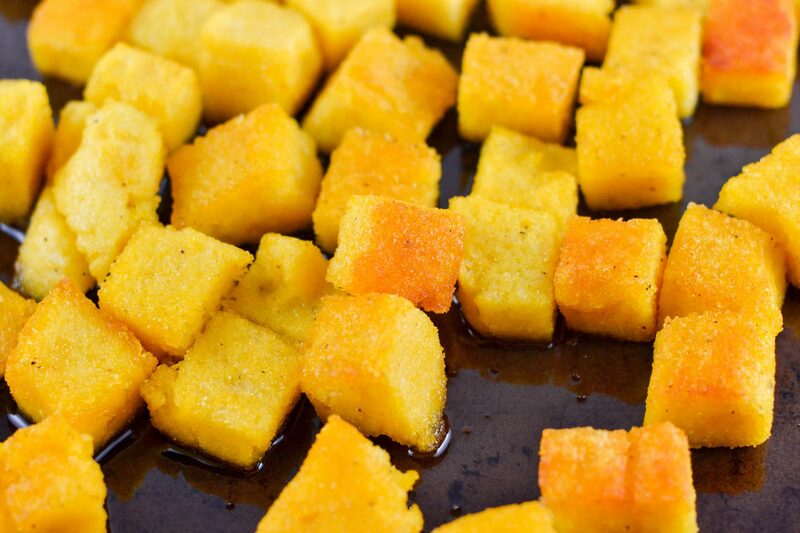 Toss the polenta cubes with 1 tablespoon of oil. Spread out into a single layer on a baking sheet (you may need two baking sheets). Broil for 10 minutes. Flip and broil for another 10 min, watching to make sure the polenta doesn't burn. Remove from the oven. Turn the oven down to 400F after the polenta is broiled. While the polenta is in the oven, make the pork. Preheat a large skillet over medium heat. Add the pork and cook 5-10 minutes, until browned and cooked through. Remove the pork with a slotted spoon to a large plate. Leaving the fat from the pork in the pan, add the onions. Cook 5-7 minutes, until translucent. Add the minced garlic and cook an additional 2-3 minutes. Add the pork back into the skillet. Then add in the dried cranberries, polenta cubes, an additional teaspoon of salt, and the fresh sage. Toss until combined. Pour the stuffing into a 9x13 pan coated with cooking spray. Drizzle 3/4 cup of chicken stock over the stuffing. Bake at 400F for 18-23 minutes, until the top is crispy. Serve. You can use pre-cooked polenta in the tube to cut out the first few steps if you prefer! This looks so tasty! Right on time for the upcoming Thanksgiving holiday. Such a creative idea. What a delicious idea to use polenta! Can’t wait to try it. 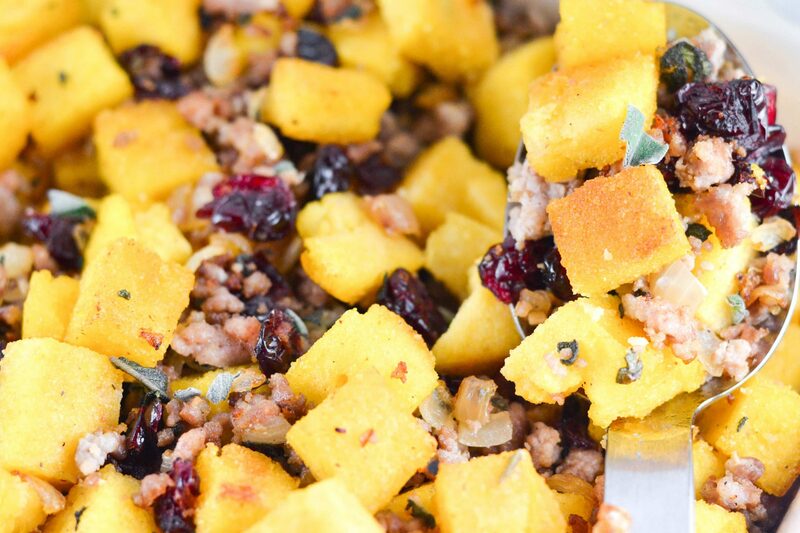 I will admit… I might have eaten a lot of crispy polenta cubes before they even made it into the stuffing! I don’t love turkey but I adore dressing, it’s my favourite part of the meal. I absolutely LOVE this. I love polenta and this would be perfect, simply perfect for any day, not just the holidays!! I can’t wait to try your polenta stuffing!! Such a great gluten-free option! Your Greats -Auntie Rose/Grandma Teresa would have used a little sage pork sausage with the ground pork! It was why her stuffing was always so good! I can only find it at the grocery store this time of year! But I might have to try this version for the GF’s/vegans that will be at my brothers this thanksgiving! Would it turn out well if I prep it all tonight and then throw it in the oven on Thursday? Hi Whitney – Yes! Do everything except pouring in the 3/4 cup stock/broth. Just have everything in your baking dish and cover with aluminum foil and put it in the refrigerator. When you’re ready to bake, pour in the broth and then bake it. Hope this helps!